Evolve HYBRID 3ATM FLOATS have arrived! 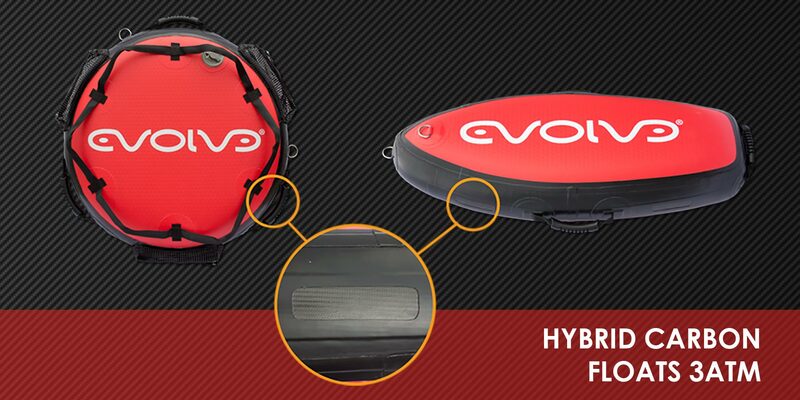 Evolve’s Hybrid 3ATM Floats have taken spearfishing and freediving to another level. Being the toughest floats that money can buy, all Hybrid Floats are carbon reinforced to provide greater resistance to compression at depth. Don’t have room to pack a hard float but worried your favorite inflatable float will compress and be lost forever? EVO Hybrid Floats gives you the best of both worlds with an inflatable that uses carbon stiffeners on the sides to strengthen your float at depth. Specifically designed carbon embedded rails allow floats to maintain integrity while heavy duty dual layered PVC material deflates and folds easily into your luggage. Not only are EVO Hybrid Floats extremely durable, they store to 1/4 of the inflated size. EVO Hybrid floats also incorporates one extra D-Ring on the front bottom of the float 6 inches back form the nose D-Ring so you are much more efficient while towing your float and completely eliminates nose dipping. Also the extra bottom D-ring allows for a second more resistant setup for adding more pressure for fighting fish. Use the bottom D-Ring in multiple float setups to avoid losing your whole string of floats to large fish.